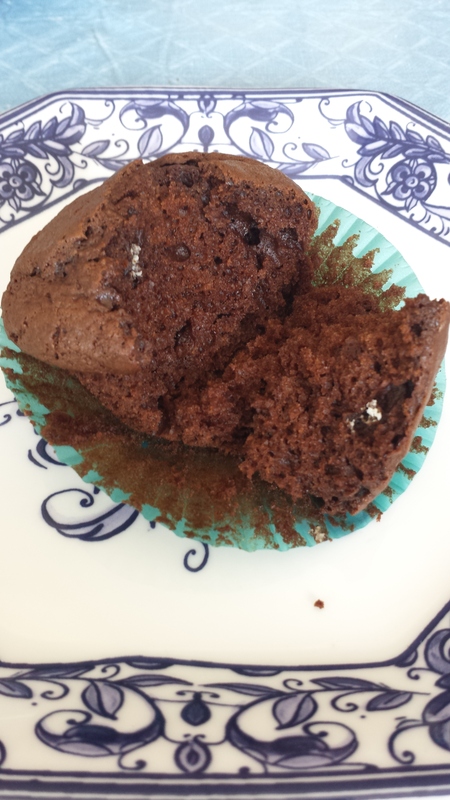 Put paper liners in muffin tins. Mix butter and sugar. Add eggs. Add buttermilk, bananas and vanilla. Add dry ingredients. Fold in pecans. Cool. Can be frozen for 2 mo in airtight containers. 2a. Mix flour, baking soda, baking powder, and salt in one bowl. 2b. Mix cocoa and hot water in second bowl. Let dissolve. 3. Melt butter and sugar in saucepan over medium heat. Remove from heat. Beat till cooled. Add egg. Add vanilla. Add cocoa. Add flour mixture. Add sour cream. Do not overmix. 4. 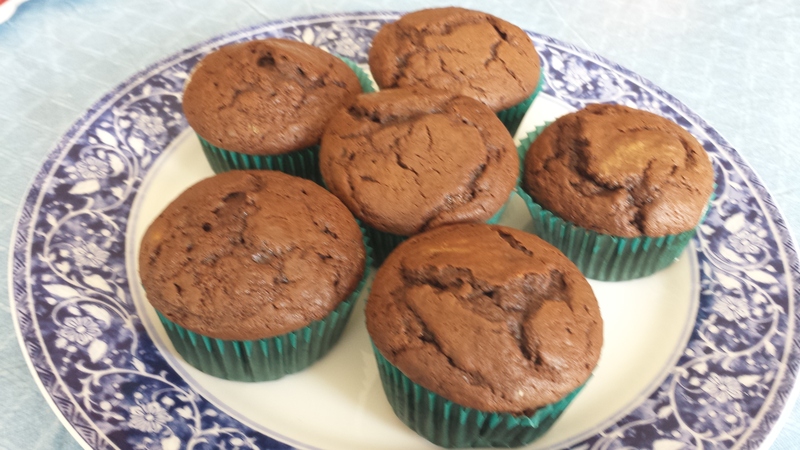 Divide batter evenly among paper muffin cups. Bake 15 min. Let cool completely before frosting. 5. Cupcakes can be frozen for two months in airtight containers. VERDICT: SO YUM!! Make it as above if you are going to use one of the frostings below. 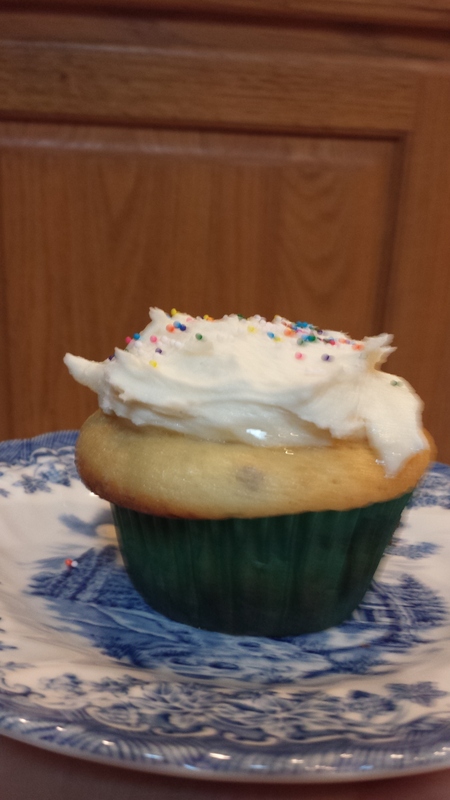 IF YOU ARE NOT GOING TO FROST THIS CUPCAKE, add chocolate chips to the batter. And marshmallow fluff or a handful of small marshmallows. Maybe some nuts? And some chopped graham crackers? Then serve with Haagen Daaz Rocky Road Ice Cream. Yum yum yum. NOTE: This is one fourth the original recipe. If you increase the above four times (or follow this recipe: http://www.marthastewart.com/1004063/devils-bundt-cake) you will have enough to fill a 10 c bundt cake pan. Then top it with frosting and sprinkle with confectioner’s sugar and serve for company. 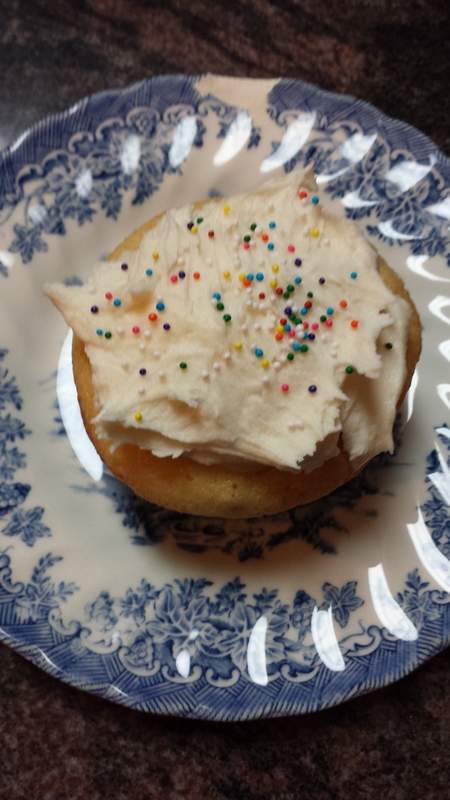 Hostess Cupcake: This cupcake can so easily be turned into a hostess cupcake! Fill it with marshmallow fluff, and top with chocolate frosting. Yum! Whisk together the flour and the milk. Heat in a small sauce pan on medium heat. Whisk continuously until it starts to thicken. Let it cook, while stirring with a rubber spatula, until you can start to see the bottom of the pan. Continue to cook until mixture has the consistency of thick pudding or paste. It an electric stand mixer, beat the butter and the sugar for a minute or two until well combined and fluffy. You’ll want to use the whisk attachment on a stand mixer if you have one, instead of the flat paddle. Then while beating, add in the thickened milk mixture and the vanilla. Beat to combine and then scrape down the sides. Mixture will separate and look messy, keep beating! Continue beating until mixture comes together and is light and fluffy, about 7-8 minutes, but time varies. Take a sample of frosting between your fingers; frosting is done when light and fluffy and sugar granules are dissolved. 4. Add greek yogurt, water and vanilla extract. Blend on low until fluffy. 6. Stir in mixins. Mix well, but not so well that cocoa powder gets integrated. If it is NOT integrated, there are cool swirls in your finished cupcakes. Remove from pan, let cool. Lasts 3 days in the fridge, a month in the frozen (unfrosted! or it gets nasty). (This is my amended Martha Stewart recipe because I don’t want to get fat by dumping whipping creme into everything). Mix well, microwave on low heat for 15 seconds, stir, microwave for 5 seconds, stir. Keep microwaving and stirring for 5 seconds until chocolate is melted and shiny. To save for later: Fridge the extra ganache. When ready to use again, add a splash of milk, and do the microwave routine from the first step again. I’ve kept mine in the fridge before two weeks without problem. YMMV. As far as how long recipes can be kept without storage: it depends a lot on where you live, humidity in your area, your fridge’s efficacy, and the quality of the products you put into your recipe. I live in Chicago, there is basically no humidity here, the fridge is all right as far as efficiency goes, and the products are standard US supermarket fare. If your circumstances are different, your results will be different too. So, as I say, YMMV. Recipe below makes 9 cupcakes. (One fourth the recipe in the book). 4. Add dry ingredients to wet ingredients. 5. Divide evenly in cupcake cups. 6. Bake 20 minutes (cupcakes will not rise). 7. Let cupcakes cool completely before frosting. 8. Frost by flipping cupcakes over into warm chocolate ganache, then adding coconut garnish. Eat immediately. Do not frost cupcakes and then try to store them, they will get disgusting. 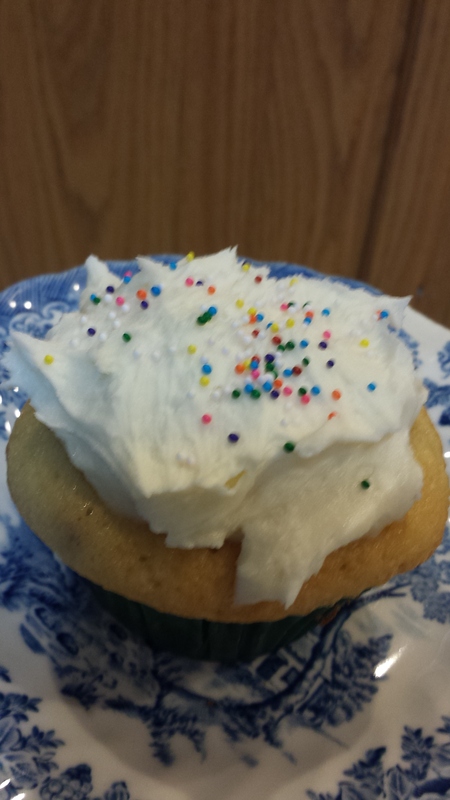 Better to freeze the uneaten cupcakes, defrost, and then add frosting when you are ready to serve. (This is my amended recipe because I don’t want to get fat by dumping whipping creme into everything). Recipe is for 12 cupcakes. I bake in a nonstick 12 cupcake pan with paper liners. Bake time may vary for you if you do something else. Pile frosting onto cooled cupcakes. Enjoy. Recipe adapted from Martha Stewart Cupcakes book.